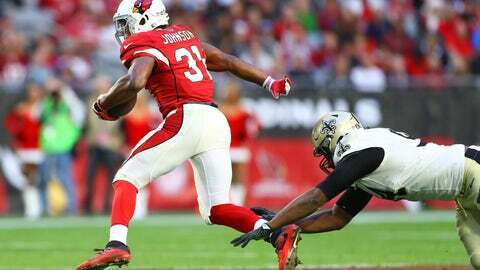 After a breakout rookie year and a monster sophomore effort, Arizona Cardinals running back David Johnson is set to be a fantasy football stud in 2017. For the past few years, most fantasy football owners tend to not really make the running back position a top priority when it comes to their respective drafts. Instead, they tend to stock up on premier wide receivers first, then use their third or even fourth pick on a quarterback, then think about which two running backs to consider. Sure, it’s a strategy that tends to work well. However, more teams are slowly balancing their offenses by having a ground game to complement their aerial attacks. The NFL is mostly a passing league these days, but running backs will reign supreme again come next season. It’s not accident that the league’s best teams all have a top running back or two that helps keep those chains moving and open up their offense to not be one-dimensional. Such will be the case with Arizona Cardinals running back David Johnson. Last season, he totaled his best year yet to the final tune of 1,239 rushing yards, 293 attempts, 16 touchdowns, and even complemented the passing game of the Arizona Cardinals. As a receiving target, Johnson totaled 879 receiving yards, 80 receptions, and four touchdowns. When it comes to young players hitting their stride, everything tends to come together in their third year. It’s when offensive playbooks become second nature and everything clicks. Since it looks like quarterback Carson Palmer is regressing from where he was just a few years ago, expect to see the Cardinals once again feature Johnson as their centerpiece on offense—even more so than he already was. If the Cardinals expect to bounce back from their 7-8 season last year, it’s imperative they put their best players in a position to succeed. That’s why fantasy owners would be wise to switch things up come next season when it comes to putting more of a priority on some of the top running backs. Players like Johnson are worthy of your second or even third draft pick due to everything they bring to the table. Johnson, as a dual-threat running back, will easily total numbers just like or even exceeding any of the top receivers owners would usually pick over a running back. Overall, 2017 will be a monumental season for Johnson since, not only is he coming along well from his knee injury (per Darren Urban of AZCardinals.com), but will look to make a huge impact in his third season.